Mainstream papers usually talk to the 'sarpanch' (village head) and a few other important people. But we talk to everyone. We are interested in everyone." This is what Shanti, 45, an ace reporter with Khabar Lahariya (KL) has to say about the country's first and only newspaper brought out by women in Bundeli, a dialect of Hindi spoken in the Bundelkhand region of Madhya Pradesh and Uttar Pradesh (UP). 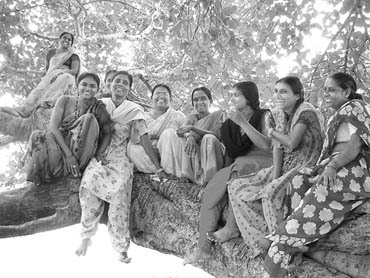 While these feisty rural newswomen — who take on the roles of reporters, editors, illustrators, proof-readers, print production workers, marketing executives and distributors — are constantly in the limelight in the districts of Chitrakoot and Banda, from where the paper is published, they are now making news as the heroines of a book by Delhi-based Farah Naqvi. 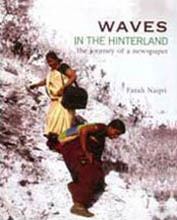 Waves in the Hinterland, published by feminist publishing house, Zubaan, takes readers on a journey through women's lives in feudal Bundelkhand and the world of small-town journalism to tell the story of an unusual newspaper and the extraordinary women who make it happen. The weekly paper, a joint effort of women drawn from the marginalised Dalit, Kol and Muslim communities of the two districts, who teamed up with the New Delhi-based NGO, Nirantar, began in May, 2002, in Chitrakoot, against all odds. The Banda edition started printing in October, 2006. At present, Khabar Lahariya has a print run of almost 5,000 copies and a readership of over 25,000 in over 400 villages in both districts. How a bunch of moderately educated women manage to bring out a newspaper with such aplomb, juggling household duties and news assignments that sometimes have them travelling extensively into the interiors, is what Naqvi reveals in her gripping book. Says Farah Naqvi, who has personally observed these women in action, "Khabar Lahariya is a kind of breakthrough that happens only every once in a while when many streams of thought and action come together in a constructive, inspired fusion. Unlike other media products, Khabar Lahariya is not guided by commercial interests, nor launched by a large media company as part of its rural outreach strategy. But the paper, like all the others before and since, has an agenda: To empower the women of rural Chitrakoot, to give them a voice, to strengthen their fragile literacy skills, and give them power to construct their own wor(l)ds. It is the product of an ideology at the core of which lie the values of feminism, equality, and justice for the most marginalised, the twice disenfranchised, the rural poor, the Dalits and women." Waves in the Hinterland is laced with details of the inception of this brave experiment and the innumerable hurdles that came in the way. It was definitely no easy task for a group of women to bring out a regular newspaper from the rural belt and this with minimal commercial interest and with the sole purpose of informing people. Yet, its circulation figures today prove that honest journalism is rewarded. Describing the details of how these women report, Naqvi writes, "Over the last four years, Khabar Lahariya reporters have attended training sessions in journalism, writing skills, computer skills and even in photography. ...The team takes many of its own decisions about day-to-day functioning, hones in on local stories worth covering, plans out its working month and gets the printing and distribution of the paper organised. They cover local news from neighbouring districts to villages with minimal editorial guidance..."
The newspaper has separate pages for national and international news, development and the panchayat. It also has a letters column. But its most important agenda is to highlight issues concerning local women and Dalits. Rooted in a strong bias towards stories of the marginalised and of women, who are at the bottom of the economic, social and political ladder, Khabar Lahariya reporters seek to uncover the realities of their lives. Sensitive to the needs of newly literate readers, the paper uses a large sized font and a wider-than-average column width. Photographs and illustrations accompany the text, again to make it visually interesting for readers. Of course, the women can do all this skillfully and effectively, thanks to Nirantar's continuous support. Shalini Joshi of Nirantar has closely worked with the team, teaching them about news-gathering, production, printing and distribution. The NGO has also financially supported the venture. Says Naqvi, "No matter how terribly marginalised you are by the vested powers, there is always a way out... to give vent to your views and opinions and the very ground reality..."
Naqvi calls this "pipeline of information" very crucial in a democratic set-up". Who knows? Perhaps the coming years will produce more newsmakers from the hinterland.